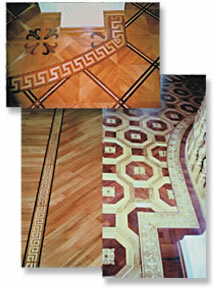 Hardwood Floor Borders and Inlays Made in U.S. Unless specified, all wood borders are supplied at an overall 3/4" thickness. You may specify an alternate overall thickness. All wood borders are square edge, straight cut, typically three foot long sections (may vary by model). Hardwood borders are sold by lineal foot, rounded up to the full foot and section length. Minimum wood floor border order is 21 lin.ft. At our discretion we can accept orders below this limit for the stock items. Corner block price equals one lineal foot of hardwood floor border unless stated otherwise. Some hardwood floor borders do not require corner block as they can be mitered 45° in turning points. Please allow for an additional border quantity if mitering the corners. 45° "turning blocks" are available at twice the regular corner price. Click on the appropriate thumbnail image to review Wood Floor Borders prices, wood species and description. In the detail window, make sure to click on the examples images, where available, to see the astonishing floors created with our distinctive flooring borders. Typically the floor border is placed around the room with about one foot distance off the wall. Popular application of the wood floor borders is to use them to separate the rooms with different floors. Another application is to define an area with the border for example around the kitchen island. Prices for borders are shown for a standard listed width, unfinished product. If you are interested in customizing a particular model, please use our contact form. You may also call us Toll free at 800-577-CZAR (800-577-2927) to place an order or ask questions. Check our F.A.Q. page to find answers to the most common questions about wood borders, floor medallions and parquet. Requires modern browser such as IE9+, Chrome, Firefox, Safari. Can be used on iPad.